That feels a little bit better, doesn’t it? I imagine most Spurs fans are resting a bit easier after Tuesday’s fairly comfortable win in Game 5 of their first-round series against Memphis. It was certainly a higher scoring game than I figured, and there were a couple of irksome elements to it, but for the most part San Antonio looked the superior team throughout, and seemed to have more answers than the questions the Grizzlies can throw at them. I wonder, am I the only one who was reminded a bit of Game 5 of the 2014 Finals against Miami? Obviously, the circumstances were different, but in both games we had Manu Ginobili pumping life into a nervous AT&T Center crowd and rescuing the team from a dreary start. Both games saw Patty Mills put the rival away with a barrage of threes. Finally, both featured a whole lot of Kawhi Leonard being an absolute beast in between. It was heartening to watch that burst from Ginobili (Spurs all-time record when that happens is approximately 329-1), especially when I wasn’t sure we ever would again. But even with the knowledge that the threat of it remains present, is that enough to suggest that these Spurs are a title contender lurking? I’m not there yet. But it sure seems like they’ve figured out Grizzlies coach David Fizdale’s defensive rotations and schemes, which is the opposite of what we’ve seen in season-ending series against teams like Oklahoma City and the L.A. Clippers. Generally in those series the Spurs found the open looks harder to come by as the games wore on, but they’ve had no shortage of them in Games 4 and 5. They had a couple of dry spells to start the game and again at the beginning of the fourth quarter, but for the most part the Grizzlies struggled mightily to keep them from getting the shots they want and the Spurs only had seven turnovers all game. Obviously the 14-of-28 from downtown colors our perception a bit. Shooting that well from outside cures a lot of ills. But the Spurs were due for some progression to the mean considering how open they’ve been on all their bricks the past few games. As I mentioned in the preview, the process was sound, the results just had to follow. 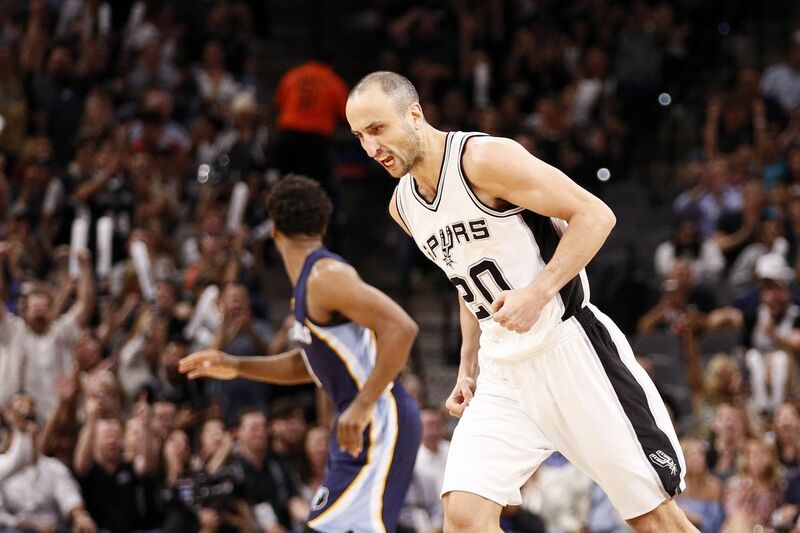 Ginobili and Mills did their part and that made the difference. As long as Leonard continues to make the right passes out of double teams, the Spurs should have no difficulty finding openings. I’m less enamored with the process defensively. I can’t fathom why Gregg Popovich insisted on doubling Marc Gasol and Zach Randolph time after time, resulting in open three-point looks for James Ennis, JaMychal Green, Vince Carter and Andrew Harrison. Corralling Mike Conley has been troublesome enough, but I feel the defensive issues have been exacerbated by trying to cut off relatively low-efficiency post-up shots in favor of allowing wide open threes. It’s just startling, to watch any game, much less playoff games, between these two teams with such sterling defensive reputations, to have these fourth quarter shoot-outs where neither side misses a shot for a four-minute stretch. Then you pull back and realize that, “boy, there sure are a lot of mediocre (or worse) defenders on the floor,” and it makes a bit more sense. The Grizzlies are without the services of Tony Allen of course, and in his stead they’ve got the aforementioned wings —including the 40-year-old Carter— plus a 35-year-old Randolph who can’t jump or move laterally. Basically, aside from Conley and Gasol their roster contains a bunch of young guys who don’t know what they’re doing or old guys who can’t make their bodies do what their brains are telling them to do. The Spurs, meanwhile, aren’t playing their best defenders aside from Leonard as many minutes as they can because of their offensive limitations. Danny Green usually plays in the low 20-minute range and Dewayne Dedmon has been dropped from the rotation. Instead, we’re seeing 26 minutes for David Lee and 30 for Tony Parker. You’ll have a helluva time finding stops under those restrictions. So if you feel like you must play sub-par defenders to keep the wheels greased on offense, the least you an do is not put them in position to fail with bad process, right? Please, Pop. Big Spain and Z-Bo are very good players but they’re not Shaq in his prime. LaMarcus Aldridge is doing a great job on them and the other guys are at least keeping their arms up and contesting, for the most part. Let them go one-on-one and keep Memphis from bombing away. Do that and I think the Spurs will have a pretty good chance of ending this series in six and freeing themselves of the Grizzlies.